I am working on the log cabin variation top. It deceivingly looks simple. 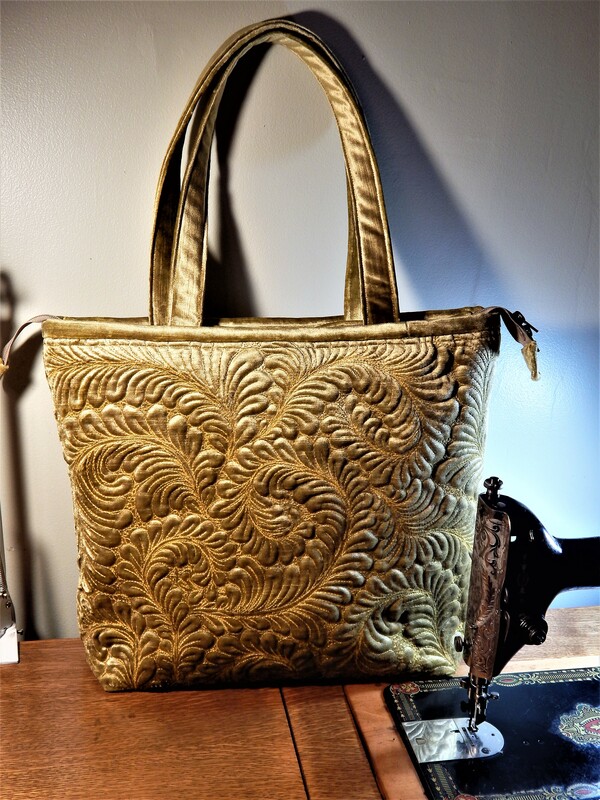 If you look at the vintage inspiration tops you can see what can happen. How did they get so off? They did not measure. It seems like a little thing but it is so important. The temptation is to cut your strip and take it to the machine sew it on and then cut off the extra. Here is a strip as an example, it is long enough with a bit extra on the right. The temptation would be to take it to the machine, sew it on and then cut off the extra bit . We like to think we are very good and have no need to pin, we can easily keep the edges together and lined up as we go. This is not a good idea because no matter how careful you think you are when you are sewing that much length there will be some fabric shifting, the feed dogs pull the fabric forward into the needle, but no matter what you do there will be just a tiny bit more pulling on the bottom piece of fabric than the top so the top will always end up just a tiny bit longer than the bottom and if you multiply that little bit row after row you end up with a very wavy top like the ones above. To prevent this measure and pin. I lay the fabric strip next to the top and mark where to cut it. I could do a ton of math and figure out the exact measurements for every piece but yikes that sure sounds painfully tedious. So I measure as I go. This prevents any slipping of the fabric across all that length. Then sew and press. Press carefully! 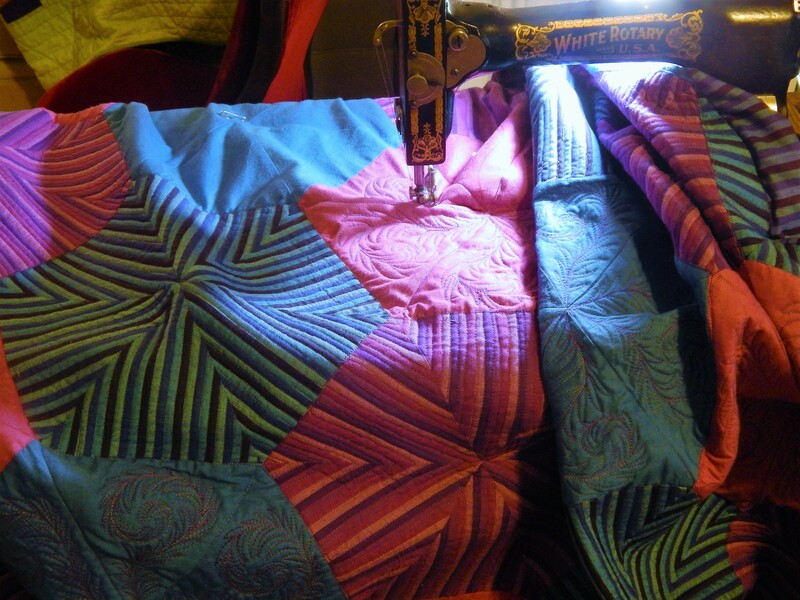 It is very easy to distort the fabric if you pull or stretch as you press. It is also not a bad idea to be sure that the top remains square as you go. I have had a few spots where I needed to trim a sliver off of the edge to square up and keep straight lines. The bigger it gets the harder it is to keep it on track and flat. I do not want a top that is a bumpy mess so I am taking my time on this. I did decide to mix up the fabrics a bit. 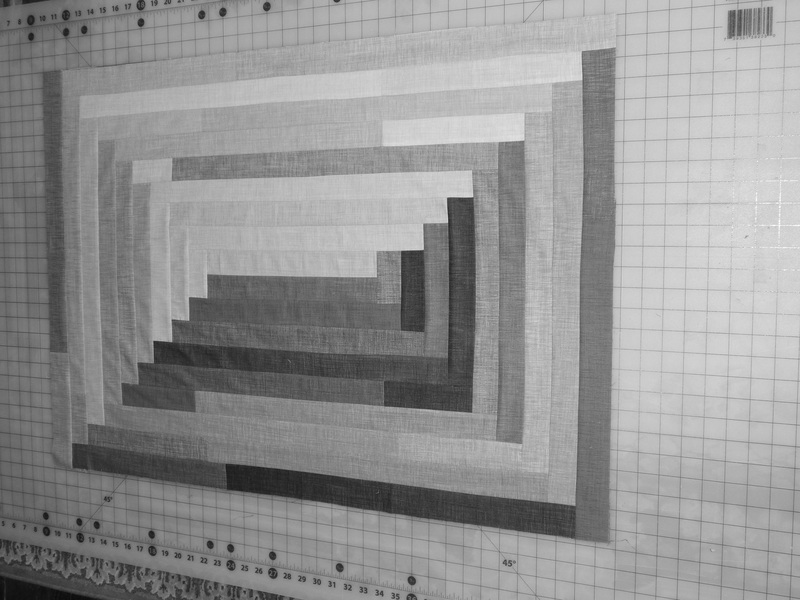 In a previous post I talked about separating the fabrics into dark and light (https://timquilts.com/2015/01/19/invisible-hand-quilting/) using a black and white photo. I decided to mix a few lights into my darks and a few darks into my lights. here it is in black and white where the value differences show better. I think it makes it more interesting to have a bit more variety. 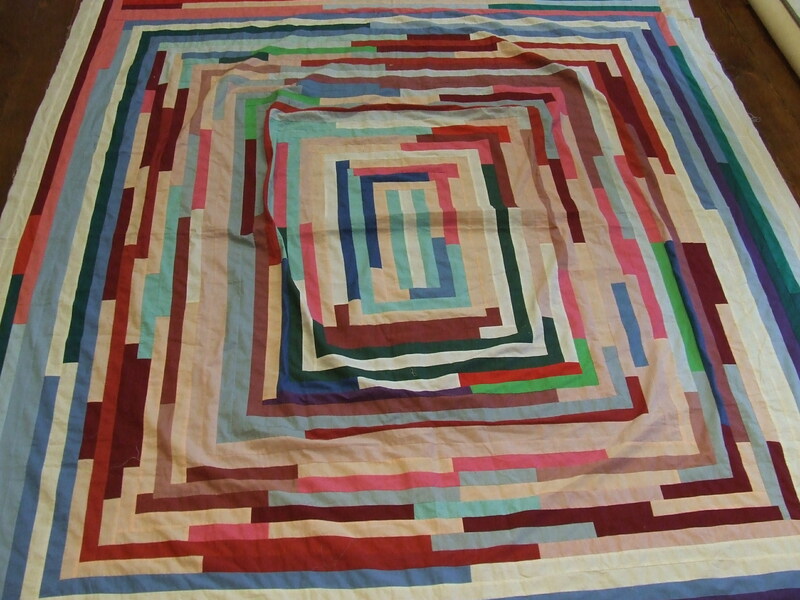 This entry was posted in Quilts and tagged log cabin, Quilting, Quilts. Excellent all-around patchwork tutorial! Thanks for being free with your help and tips Tim. This is wildly wonderful and looks like Teddy likes it, too! I totally agree about pinning. It adds time, but saves time too. 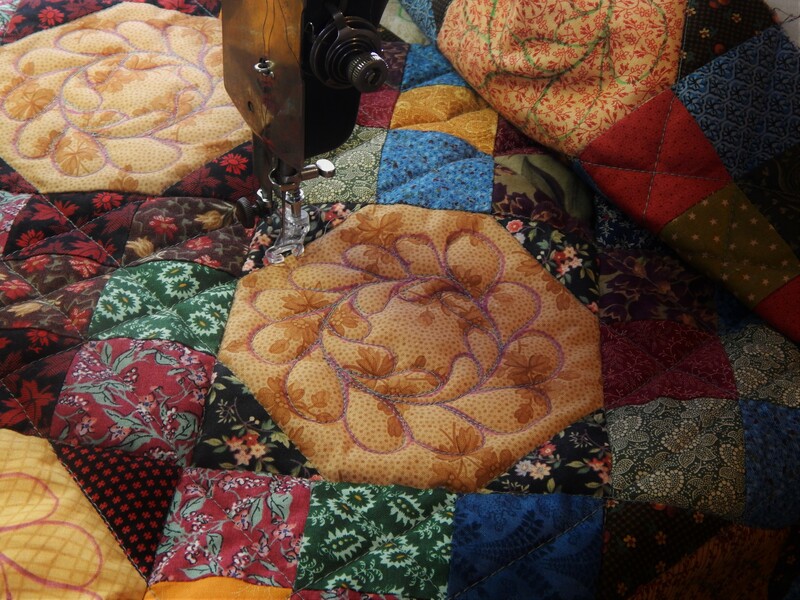 This quilt is beginning to look amazing, and I’m looking forward to seeing the finished thing. Beautiful piecing Tim. I do a lot of log cabin quilts and judges are catching that while I square up every row, I haven’t been squaring up each log at a time. Your precision will pay off! I understand that you are measuring before sewing – it always pays to be precise and take the time : your log-cabin is perfectly flat and straight! I think to sew a strip to a log cabin block in the opposite direction, you could flip the block over so that the strip you are adding would be underneath instead of on top. 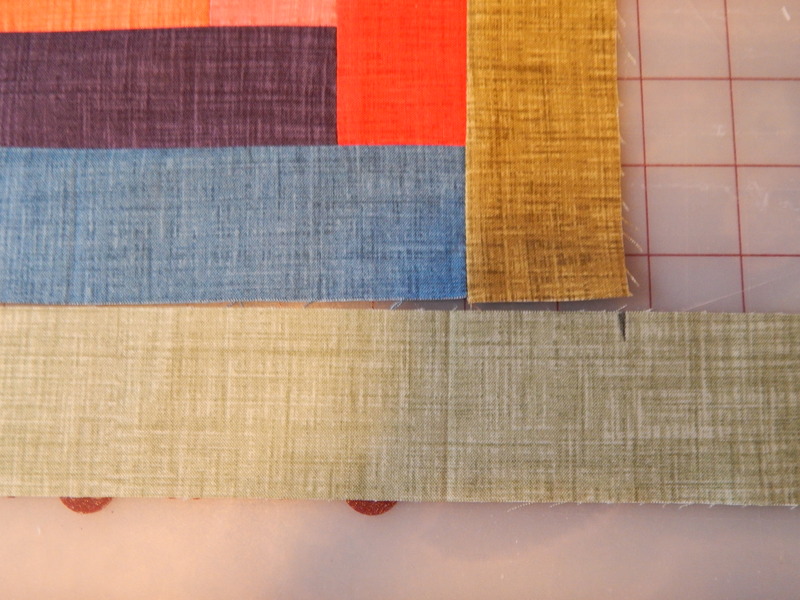 When making a lot cabin block, I prefer to cut my strips on the lengthwise grain when possible, rather than on the crosswise grain (width of fabric), as there is so much more stretch along the WOF. 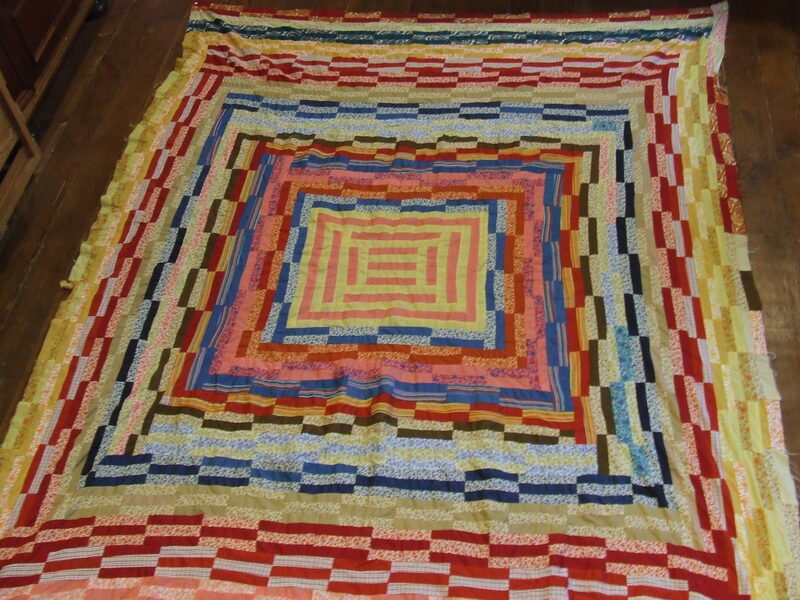 Several years ago, I made a log cabin quilt from a kit I bought at a quilt guild’s show boutique. The strips were cut on the crosswise grain, and many of them were slightly off-grain, and it was one of the most frustrating projects I ever worked on, as the fabrics stretched and frayed ad nauseum! Tim, your log cabin variation will have great visual impact! I am enjoying following your progress. Quilt on! I have the perfect sewing machine for Teddy! It is a miniature that only makes chain stitches, but he sure could use it! Following your process with much attention. I can relate to the mixing dark and light, always the question, what if? I like it. And thanks for the tips. Teddy needs the sewing version of the Easy Bake oven — the Easy Sew machine, built to scale. Then he could piece along with you. 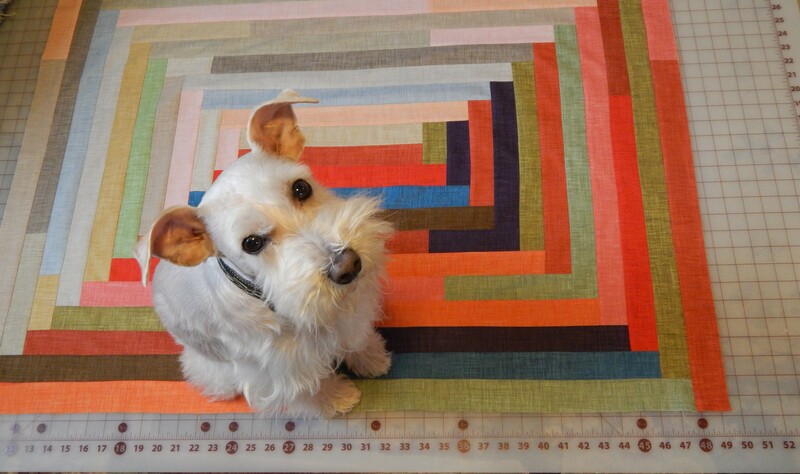 He’d could also do long-leg quilting by machine; those paws are made for walking, not for quilting. 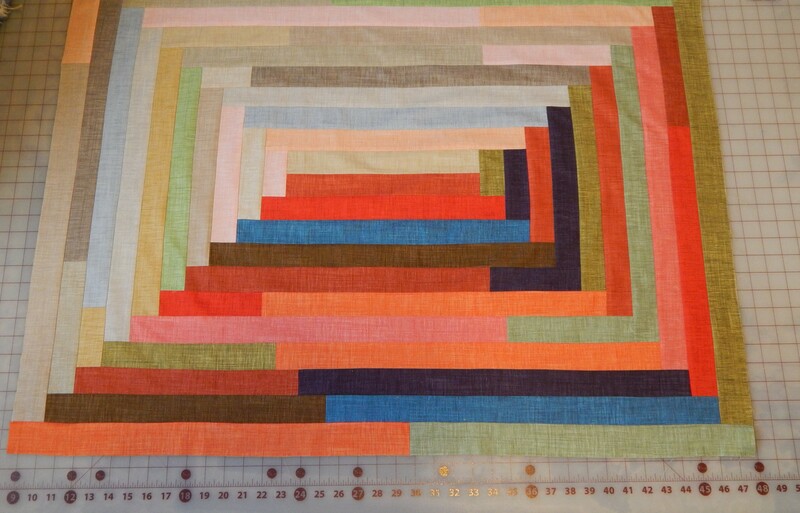 I like the idea of the Teddy’s Inspection quilt — I’m seeing it: the seemingly random steps that actually conceal acute analysis of the surface area would make a great pattern. But I also agree that getting the Maestro’s paws dipped in the ink would likely disturb his inspecting rhythm. I’m a big fan of pinning, and of measuring. 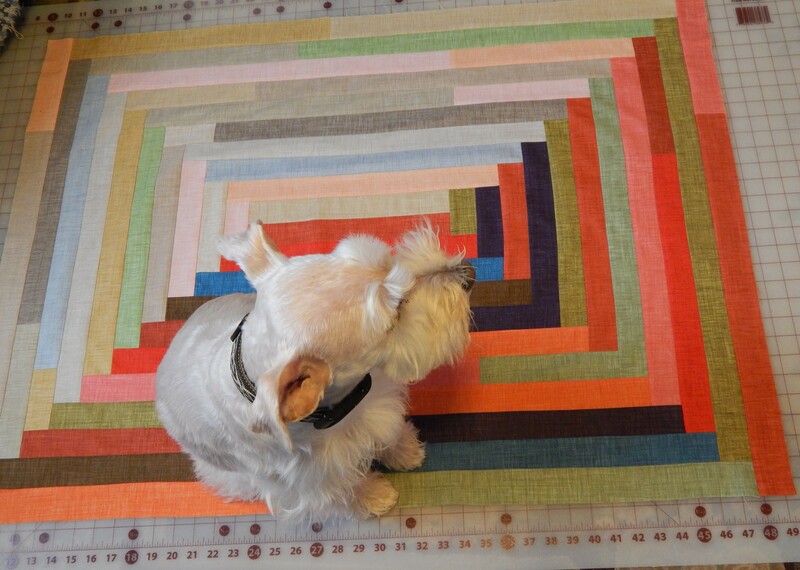 I make a lot of medallion quilts, so each border is an adventure. I’ve learned a lot of tricks for making it work, not just making do. (OK, yeah, I do that sometimes, too!) But pinning is essential no matter what. Love it! So pretty, so different. Now if i could just finish my UFOs, I could start on one of these. Like the top you’re making. It does take time and lots of patience but, it pays off in the end. Happy piecing. I think Teddy is beautiful because, he has normal ears and a normal tail. I don’t think people should crop dips tails or clip their ears. It should day dogs tails. Not dips. Another idea to avoid the uneven pull of the feed dogs is to piece using a walking foot. I have begun using this for borders and always when attaching my binding. I love the colors you’ve chosen. Your explanation of why it is necessary to measure and pin is really helpful. 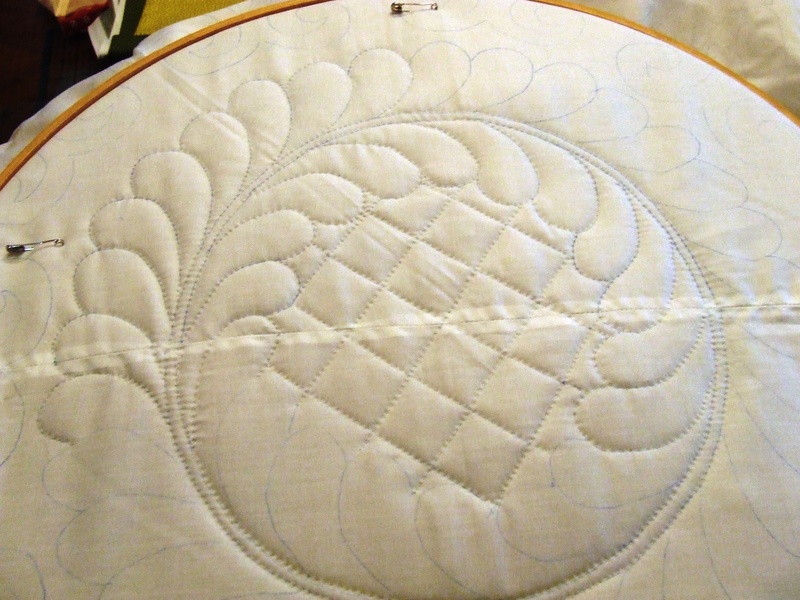 As a new, self-taught quilter, knowing the reason behind what seems like an unnecessary step is so helpful. Thanks for helping me enhance my skills and improve my quilts. I’m thinking of doing something like this to just get me going. Just “play”! 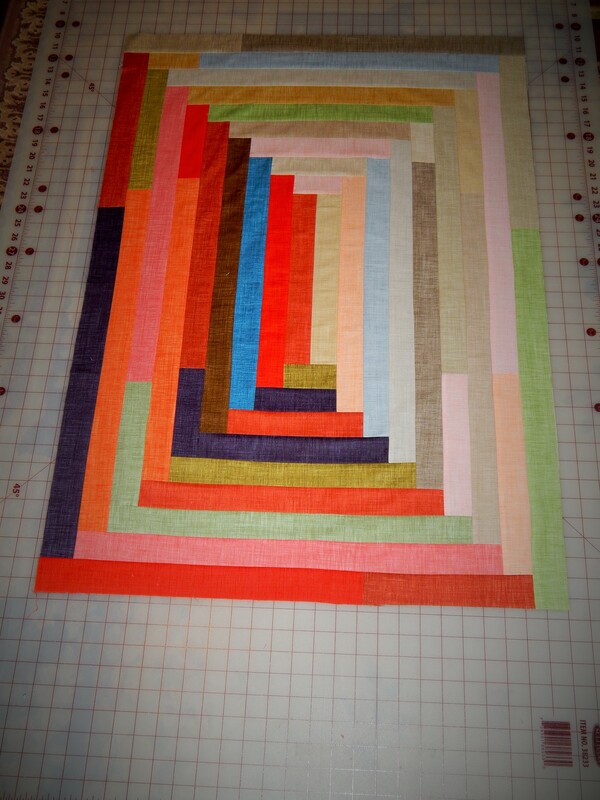 I am in the process of cutting 1-1/4″ strips for a log cabin quilt – it will be a rectangle but not light and dark. As someone mentioned above I cut these strips the length of the fabric as there is very little give that way. I was going to eyeball the length, but you have convinced me to measure cut and pin!